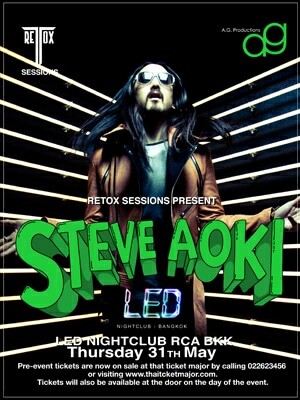 AG Productions & RETOX SESSIONS proudly presents Steve Aoki, a California based DJ & Producer is set to take over the DJ decks and bring his madness back to Bangkok crowd at LED nightclub on 31 May 2012. Steve Aoki, a Superstar DJ and Producer, is the man behind Dim Mak Records, founded in 1996. 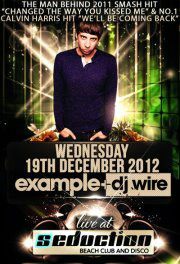 Since founding the label, he has stepped into limelight and become one of the hotly sought-after DJ in the world. Having performed average 250 shows a year around the world, Aoki has never failed to impress the masses with his upbeat electronic/house sounds and the remixes of many artists like Michael Jackson, Jackson 5, Kanye West, Eminem, Lil Wayne, All American Rejects, Refused, The Killers, Lenny Kravitz, Bloc Party, Snoop Dogg, Kid Cudi, to name a few. His solid musical flair brought him a multi awards such as Best DJ of the Year by Paper Magazine 2007, Best Set of the Season – Ibiza Award 2007, Best Party Rocker DJ – BPM Magazine 2007 and Best Mix Album of the Year – Billboard 2008. His label, Dim Mak has featured some of the most revered dance music producers in the industry such as in Tiësto, Etienne De Crecy, Bloody Beetroots, Dada Life, Felix Cartal, Atari Teenage Riot and The Kills. It is also a house that producer quality artists such as Bloc Party, Klaxons, MSTRKRFT, The Kills, Pretty Girls Make Graves, The Von Bondies, and The Gossip whom had their career launched by Aoki. 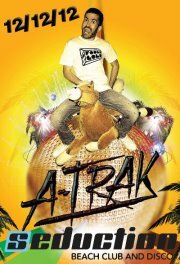 In January 2008, he unveiled his debut mix album Pillowface and His Airplane Chronicles on Thrive Records. It featured tracks by Justice, Klaxons, Mystery Jets, Peaches, Datarock, Yelle, Franz Ferdinand, Bloc Party, and Scanners which most of them are remixed. This album reflects his renown of a tastemaking dance-party DJ. 2010 saw him release the single “I’m in the House” with Zuper Blahq, alter ego of Black Eyed Peas singer will.i.am. The song charted at #29 in the UK Singles Chart in its first week of release. In January 2012, he materialized a full-length album ‘Wonderland’ featuring LMFAO, Kid Cudi, Travis Barker, Will.I.AM aka Zuper Blahq, Wynter Gordon, Rivers Cuomo – Weezer singer, Lil Jon, Chiddy Bang, Lovefoxxx of CSS, Big John former guitarist of the punk band The Exploited, and others. Attesting to his global appeal, he has started touring with production via bus tours like the spring 2012 Deadmeat Tour, he headlined over 55 cities in 60 dates across the United States and Canada. 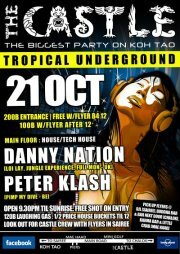 There will be an open bar from 9.30-10.30pm and any entry afterwards will receive one complimentary drink.